Honeycomb shades are a popular window fashion because they offer privacy, insulation, and light control. 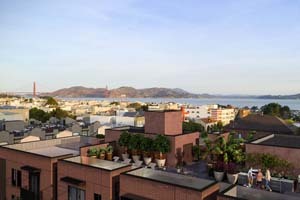 Here at Blinds & Designs in San Francisco, our customers often admire their beauty and energy efficiency. If you’re interested in seeing them in action, speak with one of our trained specialists today! 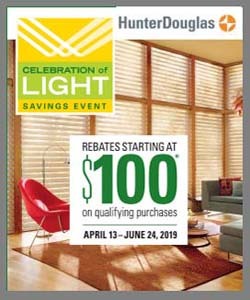 Hunter Douglas has updated the Duette honeycomb shade this year. You’ll find a new honeycomb-shaped headrail, which allows the eye to follow the honeycomb design from the top of the shade to the bottom. There’s the new UltraGlide® Wand, which is a child-safe, retractable cord system that has a decorative wand/tassel and can coordinate with the rail color. You might appreciate the seamless Duolite™ design—with a sheer fabric on top and a semi-sheer, semi-opaque, or opaque fabric on the bottom, it’s basically two shades in one, giving you much flexibility to manage your light and privacy needs. The fabric roster includes three striking new offerings. Northwood has a rustic charm and clean modern lines. Alexa offers an organic feel. The new exclusive Alustra® Duette® Architella® fabric, Jardin, is created from textured yarns for that casual-chic look. The Duette honeycomb shade line has a total of 39 fabrics with over 420 colors. The Vertiglide™ Honeycomb Shade is essentially the Duette fabric turned 90 degrees so that the shade can be operated from side to side versus up and down. This orientation is ideal for glass sliding doors and large openings. 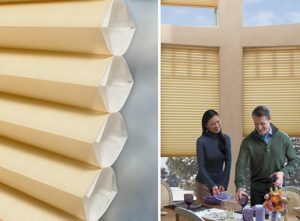 In all, Duette Honeycomb shades offer a simple, sleek look for modern spaces, but also work well in traditional setting. The ultimate benefit, of course, is that they almost pay for themselves with the energy savings you’ll enjoy.